Bed-and-breakfast owner Lindsey Porter prays she won't run into Stephen Chase when she returns to Shelby Lake. Five years ago, the cop jilted her to marry another woman, and Lindsey fled town. But no sooner does she hit city limits than Stephen pulls her over for a broken taillight. Despite the past, he's still able to stir up Lindsey's old feelings for him. Now a widower and single dad, Stephen recognizes a second chance when he sees one. And he'll do anything to make Lindsey trust in God and take a risk for love—again. Any moment now, Lindsey could put the car in Drive, touch the gas pedal, drive past the green-etched Welcome to Shelby Lake sign and return to her past. Another hundred feet and she would be back. Visitors traveled to the northwestern Pennsylvania lake-front community to get away. She escaped to put her life back together. Center Street unfurled like black satin ribbon under a canopy of evergreens and multicolored maples and oaks that would take her right down memory lane. Past the elementary school where Mom taught kindergarten. Past Aunt Claire's sewing shop. Past Mrs. Lawson's pink-sided house with the plastic yard goose she dressed each holiday. Past the church where Lindsey almost said "I do." Mom, why did you have to fall down the stairs? Lindsey gripped the steering wheel, pressing her forehead against the powder-blue fuzzy cover. Maybe banging her head against it would knock some sense into her brain. She'd made promises that never, ever, not in a thousand years would she return to Shelby Lake. But promises didn't account for widowed mothers who might slip on a dirty sock on the stairs to the laundry room. Next to her, on the seat of her friend's borrowed Taurus, her cell phone chimed. She read the display. Perfect—Granddad checking in. He probably expected her to hedge at the city limits, weighing the pros and cons. Like for the past half hour. She answered the call. "I'm on my way, really." "No doubt in my mind, sweetness. Your mama's been taken to X-ray. She's asking for that quilt—you know, the one with all those circles—off the recliner near the davenport. Could you pick it up on your way?" Granddad's voice betrayed an edge of stress—playing family watchdog for the past five years whittled any visible panic from his voice. "Can you hurry?" "Yes…sure. I'll be there in about twenty minutes or so." She ended the conversation and clenched the phone. Quilt with circles, Granddad had said. The wedding ring quilt on the recliner near the couch. Dad's recliner. Closing her eyes, she could picture him sitting there—feet crossed at the ankles, hands tucked behind his head. An ache pinched her chest. But she would do it. For Mom. She imagined her mother, fragile, her eyes wide with pain, maybe even fear as she lay puddled at the bottom of the stairs, or trying to drag her broken body toward a phone. If Lindsey hadn't swept the Shelby Lake dust off her feet, she might have been there. Might have heard her cry out. Or rather, might have been the one carrying the laundry downstairs. She glanced at the sign again and released a loud sigh. Okay, so the town had fewer than five thousand people. Entering city limits didn't guarantee she'd see him. Or his son. Or run smack into the humiliation of being left at the altar. It felt that way. Come on, who calls off a wedding a week before the big day? Still. No one really lived down being jilted for another woman. Especially when they married within a month of her broken engagement. She couldn't stand the looks of pity that would follow her like a stray pup. She'd grab the quilt, pop into the hospital to check on Mom, make sure someone from the church signed up to serve meals and then head back to her small country inn in Maple Valley. In, out, fast, simple, and with any luck she wouldn't bump into the man who had left her heart in pieces, scattered across Shelby Lake. Clouds resembling curdled milk smudged the morning horizon. Raindrops pinged her windshield in a lazy-Sunday-afternoon manner. A sliver of sunlight sliced through the tree limbs, over the rooftops of the houses lined up like first graders, beckoning her, calling her to come closer. If she didn't do it now, she'd end up putting her car in Reverse and making the two-hour return trip to Maple Valley without looking back. But she couldn't disappoint Mom. Not this time. She shifted into Drive and checked for traffic. None, of course. She had just coasted over the county line into Shelby Lake when she heard the blip of a siren. A cruiser pulled up behind her. Seriously? She was barely moving, let alone speeding. Putting the car into Park, Lindsey dragged her fingers through her hair and rested her elbow against the door. Maybe the officer would be one of the older guys. One of Dad's buddies. She used to have the entire force on her Christmas card list, but, life had taken a detour the morning her father had been shot during a routine traffic stop and died a couple of hours later. And a girl had a right to close the door on a chapter of her life and start over, right? The door to the cruiser opened. Lindsey squinted in the rearview mirror to see if she recognized the officer. With his head turned, she saw only dark hair cut above his collar. He paused to talk into his radio. She drummed her fingers on the steering wheel. "Come on. Come on." He approached the car. She leaned over to scrounge through napkins and ketchup packets in the glove compartment for the vehicle registration and insurance card. Of course her car—a silver convertible that she would have preferred driving for this foray into her past—sat in the shop, getting the brakes replaced. A girl should have at least a month's notice before she returned to her former life—lose those extra five pounds, get her hair cut, a decent manicure and definitely get her hard-earned sporty wheels detailed. Still, Rita's ancient beater had saved her hide. And again, it wasn't as if she'd run into anyone she knew. A rap on the driver's window sent her heart skidding. Lindsey cranked the window open with one hand while trying to free her driver's license out of its plastic holder with the other. A rain-scented breeze frisked her cheek. "What's the matter, Officer?" Eyes glued on her wallet, she tried, oh, how she tried, to keep the annoyance from her voice. "I was barely moving." "Ma'am, did you know your left taillight is out?" Oh. She'd turned her lights on during the rainstorm. Busted. "The car's not mine. Belongs to a friend." "I need to see your driver's license, vehicle registration and proof of insurance, please." For the first time, she heard, really heard, the voice. Deep, with threads of humor around the edges, and the finest sense of control. A man of patience, of honor. She closed her eyes. Really, God? He was so not on her side. "Yes, just a minute." Stephen. Or maybe Officer Stephen Chase. She ground her teeth, focusing on the fake pine-tree air freshener dangling from the rearview mirror. "Stephen." His name slid out as a strangled whisper. Then, because she had to, she hazarded a look. And yes, God certainly knew how to spear her in the heart, because if possible, Stephen had only become more handsome. Apparently that's what marriage and fatherhood did to a man. Clearly five years wasn't enough to get over those blueberry-colored eyes, that dark, wavy, run-her-hands-through-it hair, the devastating cleft in his chin. His smile belonged in an ad for men's cologne. And still managed to send her heart into a tailspin. Now, he just roamed about in her dreams, in the hours between waking and sleeping when she had no defenses. Lindsey squeezed her eyes shut and then opened them again. Just to make sure. Nope, he hadn't been a figment of her imagination. Stephen's eyes had widened even as his mouth dropped open. Good. She shouldn't be the only one squirming here. Unfortunately, he recovered more quickly. "Lindsey Porter. It's been what? At least five years?" "Something like that." Five years, two months and three days, if someone bothered to count. "This is not your vehicle." He stood with hands on his lean hips and feet shoulder-width apart. "Captain Obvious." No need for sarcasm. He was only doing his job. Because, you know, apprehending hardened taillight-defying criminals would certainly solve the world's problems. Or find her father's killer. "Mine's in the shop. Borrowed this from my assistant manager." He nodded and then crossed his arms over his chest. The stretched navy fabric of his uniform emphasized the breadth of his shoulders. She averted her eyes. ABBA came on the radio, belting out "Take a Chance on Me." Lindsey flicked off the radio. So not going to happen. "I should probably give your friend a ticket. It's dangerous to drive around without taillights—especially in weather like this. You just missed a downpour that came through here. What if the cars behind you couldn't see you slowing down or turning?" "What cars? And no, I didn't miss it—drove through it, thank you. Without an accident, even. Imagine that." He stared at her, and she seemed to see the words linger outside of her body, as if she wasn't sure where they came from. In the wake of her sarcasm she wanted to slink into her seat, maybe climb under it. His cheery demeanor vanished. "I'm serious." She blew out a breath, staring at her whitened knuckles clenching the steering wheel. Schooled her voice. "Sorry. Look, I know. I'll be sure to let Rita know, okay? Write me a ticket or whatever, but please hurry. I have to go. It's an emergency." Suddenly she needed her mother. "If you were in such a hurry, why did you idle near the sign for the last thirty minutes?" "You were watching me?" She fought to keep the squeak out of her voice. She didn't expect any spectators while she psyched herself up to cross the county line. Should have known better. "Someone called in suspicious activity. I had to check it out." He frowned, but the hard set of his jaw relaxed. "What kind of emergency?" Blinking back sudden, crazy tears, Lindsey forced herself to hold Stephen's gaze. "Mom. She fell down the stairs and broke her leg." Stephen relaxed his stance, rubbed a hand across the back of his neck and softened his tone. "Linds, I'm sorry. That's tough. How can I help?" How could he help? How about making sure she didn't run into him the first twenty-four hours she was in town? How about picking up the pieces of her broken heart, pasting them back together? How about telling her that he'd been wrong for choosing Bethany over her? No, she didn't want that. Not anymore, at least. "Let me go so I can get to the hospital." And out of Shelby Lake as fast as possible. He stepped back, nodding. She waited a moment for a "nice to see you" or even "want to get a cup of coffee?" But it didn't come. Because some things simply couldn't be fixed. Stephen jammed himself behind the wheel of the cruiser. Thunking his head against the headrest, he groaned and scrubbed his hands over his face. The life he put back together piece by piece during the past five years scattered like Ty's bucket of Legos with a single glimpse of her. Seeing Lindsey stole his breath. He expected a middleaged woman driving the late '80s blue Ford Taurus. Not his former fiancée. Wow. She looked amazing. Time had only done her favors. Her hair still looked like the sunrise over the lake, and how he longed to touch it. Weave it through his fingers. It was shorter, although he liked it above her shoulders. Made her look less like a teenager, more like a woman. A woman who hated him. He needed to keep that fact in the center of his thoughts. The police band chattered in the background, reminding him to radio dispatch and let them know he was back in service. But he tuned it out for a minute. He needed to regroup—force his hands to stop shaking and bring his thudding heart under control. A cold sweat slicked his face. He lowered the window. The crisp breeze fanned his clammy skin. His cell phone vibrated against his hip. He released it from the belt holster and glanced at the display. His sister. He flipped it open. "Hey, Mel. What's up?" "Stephen, why are you answering your phone? You're on duty." "An eye for detail, as always." "Okay, okay. Listen, I didn't expect to talk to you. I mean, I called, but I figured I'd get your voice mail. Nate and I are grilling tonight. With friends. Why don't you and Ty join us?" "Which friends? It's supposed to rain tonight." "The patio is covered. Bring a sweatshirt. Oliver and Amy are coming. And, well, Ginger, a new girl in our morning Bible study who could use someone to show her around." "Isn't there a church rule that says pastors' wives are forbidden to torture their brothers with their not-so-subtle matchmaking schemes?" "Hey, I'm not doing anything of the sort." "Leave the matchmaking to the Tea Grannies, Mel." He referred to the group of five ladies in his church who felt it was their God-gifted mission to make sure the singles in the church were paired up—whether they wanted to be or not. "I just thought…well, it's been almost a year." "Forget it. Not. Interested." Knowing she was only trying to help, he softened his tone so he didn't sound so much like a jerk. "Thanks, anyway. I need to get back to work." "Well, stop by and grab something to eat." "Maybe." He hesitated, not sure if he should say anything yet, but she'd find out soon enough. "Hey, Mel. Uh, Lindsey's back in town." "What? When? How do you know?" "Someone called in a lurker down by the welcome sign. Had to check it out. Turned out to be Lindsey. Apparently Grace Porter fell and broke her leg." "You've seen her. Oh, Stephen…I'm so…How are you doing? I mean, seeing her must have been…wow, like a total shock or something." "That would be the understatement of three lifetimes. Listen, I really have to go. Call Ma, will you? I'm sure she'll want to know about Grace." "Yeah, sure. As soon as Nate's done with his sermon prep, we'll head to the hospital to check on Grace. Maybe I can catch Lindsey. Call me later if, you know, you want to talk or anything." Stephen snapped the phone shut and dropped it on the seat beside him. Life couldn't be easy, could it? 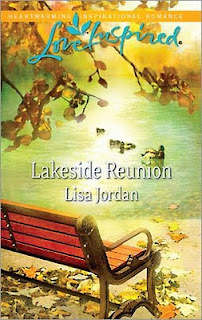 Lisa is holding a scavenger hunt and lakeside photo contest to promote her Lakeside Reunion release. Plus, blog commenters on the blog hop will be put in a drawing for fun prizes—breakfast basket, Love Inspired Authors basket, autographed copies of Lakeside Reunion. Visit her Lakeside Reunion Contest page for more information. The token for this blog is a cup of tea.